Take 25% Off Your Order with Code: BBEASTER. Offer ends 04/22/19. Limit 1 coupon per offer. Exclusions apply. Cannot be combined with other coupons or discounts. Not applicable to previous orders. Free ground shipping on all orders in the 48 contiguous states. In-stock, non-custom-non made-to-order products ship in 3-5 business days. *Offer excludes Hyperice, DonJoy Performance Bionic™ Reel-Adjust Wrist, DonJoy Performance Bionic™ Reel-Adjust Back, Aircast Walking Boots (Standard, Elite, Short, SP, FP, XP), Aircast Foam Liners, and Compex Edge 2.0. For a complete exclusion list, contact customer service. If you would like to purchase both products eligible for coupon code and products excluded from the promotion, please make two separate transactions. If you have questions, please contact customer service for assistance. Medicare will pay for medical equipment and supplies only if a supplier has a Medicare supplier number. We do not have a Medicare supplier number. Medicare will not pay for any medical equipment and supplies we sell to you. You will be personally and fully responsible for payment. If you happen to find a lower price anywhere on an identical item, just show us the price and we will match it! BetterBraces.com works hard to bring you low prices. If you have found a better price for this item, at another authorized dealer, we will match it - Guaranteed! In order for us to match the price please email a link of the competitor's website to Service@BetterBraces.com and we'll confirm their price is lower. We'll then contact you with further instructions. This is not an automated process, but we will respond as quickly as possible. If you need a more immediate response, please call 1-800-553-6019. This guarantee does not apply to shipping charges. If the competitor limits quantities we reserve the right to do so as well, and if the offer is footnoted by "while supplies last", we reserve the right to confirm that the competitor still has the item in stock. Our Price Match Guarantee does not apply to competitor's bonus offers, Ebay auctions, free offers, auction websites, non-retail(wholesale) websites, private sales, special orders, typographical errors, clearance sales, liquidation sales, mail-in rebate offers, or where a service commitment is included in the transaction. Internet competitor offers must include shipping and handling charges as the basis for comparison. Additionally, we must be able to verify that it is the exact same product in brand-new condition. Price match guarantee does not apply to non web-based stores. Price matching is subject to providing proof of the manufacturer's part number and availability of the product. (i.e., current dated advertisement, register receipt, copy of webpage or catalog page) of a lower price, plus your original receipt to claim your refund for previous purchases. The terms of this guarantee are subject to change without notice. Why are online bracing products less expensive than the ones purchased in a physician office? Comparing the cost of a device online vs. the cost of the same device provided in a medical professional’s office is not a valid comparison. As the consumer, you have to decide what is right for you and consider the trade-offs. Sure, online products tend to be less expensive – but you also lose the important services and benefits outlined above. Please make your decision carefully and, when in doubt, consult your medical provider and insurance company. Quite simply, we want your purchase to work for you. Our no-risk, unconditional 30-Day Money Back Guarantee allows you ample time to see if your investment in your health is doing the job you expect and deserve. If, after trying the product, you are not completely satisfied, you may exchange the item or return the product for a refund of the full purchase price (minus shipping & handling) within 30 days of the purchase. Be advised the return must be received in our warehouse prior to the end of the 30 days for your refund to be processed. Please note: The DonJoy Defiance Custom Knee Brace does not qualify for the 30 Day Money Back Guarantee because it is custom made. Orders will be shipped within 1 business day for in-stock merchandise purchased before noon pacific time Monday to Friday. Orders made on Saturday or Sunday will be shipped the following Monday ex. Public Holidays. If a product is out of stock customer will be contacted with an updated ETA, an alternate item, or offer of a refund. Shipping charges are calculated based on the weight of the products you are purchasing and your delivery address. You can view the shipping costs for the products you want to purchase by adding them to your cart and proceeding to the checkout page. Shipping rates are calculated based on the weight of the items in your shopping cart. Delivery dates are determined based on the zipcode of your shipping address. We ship all products to APO/FPO addresses with the exception of Compex Units. Only Compex accessories are shipped to APO/FPO addresses. Standard overnight is delivery by 3pm; 8pm for residential addresses. Priority overnight is delivery by noon; 3pm for residential addresses. The DonJoy Spider Elbow Pad is designed with a honeycomb structure that contours to your elbows to provide cushioning and comfort. Because of the DonJoy Spider Elbow Pad's anatomical design, it's less likely to shift around while you play sports and participate in other physical activities. The DonJoy Spider Elbow Pad is great for volleyball, basketball or even during job-related activities that require cushioning elbow protection. Please note that each elbow pad is sold individually, not as a pair. 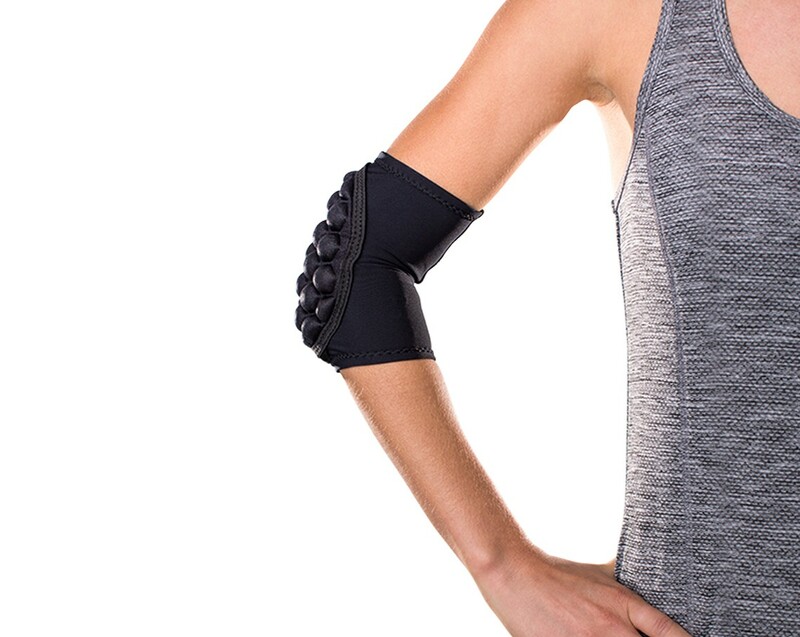 Product Features... and the benefits you'll experience with the DonJoy Spider Elbow Pad! Honeycomb design contours to the elbow while providing soft and durable support. Low profile and stream-lined so that it doesn't move around or get in the way during physical activities. Yes you can use the DonJoy Spider Elbow Pad in the water. Just make sure you rinse with fresh clean water and let it air dry. Is this an elastic sleeve that you pull over your elbow? or does have velcro to adjust fit? The DonJoy Spider Elbow Pad is a sleeve you pull on, there is no velcro adjustment. My arm at the elbow joint is exactly 11 in. Would I order a L-large or XL-extra large? Would the Large be too tight?? Do you accept Atena insurance ? What is the HCPC billing code for this item, or is this non-billable to insurance ? How do I clean my spider elbow pad? Hand wash with mild detergent and air dry. The sizing is based on the circumference of your elbow joint. Are these sold in pairs? The Spider Elbow Pad is sold individually. If you have additional questions, please call 1-800-553-6019.
can this be worn as a replacement for standard elbow pads for hockey? Yes this can be worn as a protective pad. Send us an email @ service@betterbraces.com with the size, and I'll give you an up-to-date inventory check. Works well but stretches over time. They work well but the elastic stretches over time. If you are between two sizes, buy the smaller one. I have been using these for over six months now and they have eliminated my tennis elbow injuries without having me take medications. Thank you. I have a bone spur from a car bicycle accident when I was young. Shooting prone is painful. These totally protect and eliminated the discomfort. Cons: The Elastic stretches over time, order a tight fit.